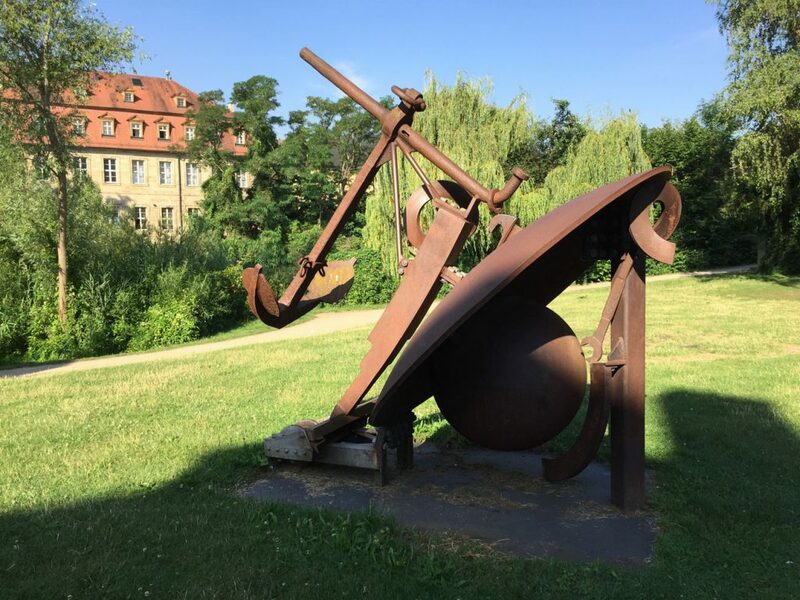 Bamberg sculpture path – the curse of the world heritage. Bamberg and contemporary art is the story of a polar opposite like day and night. Nevertheless Bamberg possesses a sculpture path that is second to none in the world. With its one thousand years old history, built on seven hills like Rome, and endowed with the picturesque backdrop of Little Venice Bamberg offers the very best conditions to take full circle from the Romanesque, Gothic, Renaissance and Baroque periods to the present. 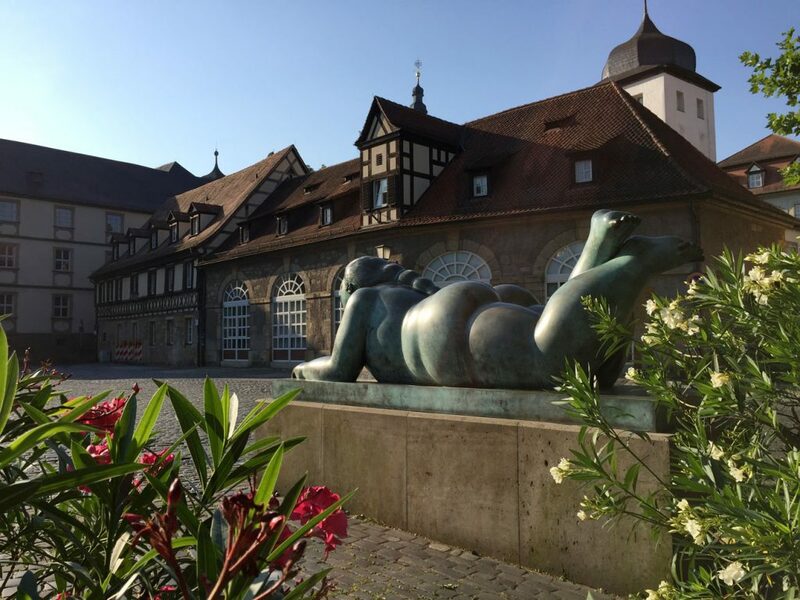 Since the first exhibition of large sculptures by Fernando Botero in 1998 also contemporary art has arrived in Bamberg, the city of Bamberg, however, still hasn’t arrived yet at the art of the present until today. On public places and in the urban space sculptures by renowned international artists are an exciting counterpoint to the historical backdrop with its gothic and baroque art treasures. 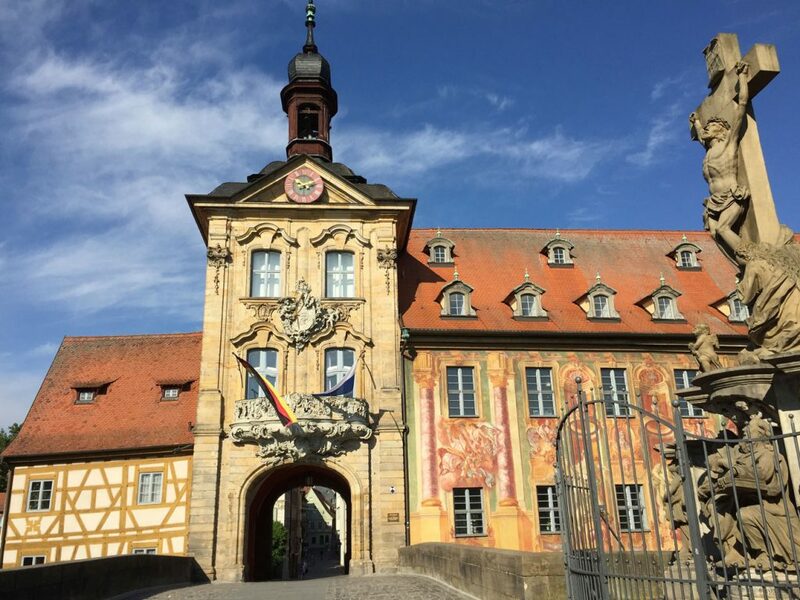 Since 1993 the historic centre of Bamberg is a UNESCO world heritage site, visitors who stroll through the medieval alleys unexpectedly encounter works by international celebrities like Fernando Botero or Markus Luepertz. Bamberg owes this wealth an initiative of the Internationales Kuenstlerhaus Villa Concordia represented by founding director Dr. Bernd Goldmann. Between 1998 and 2006 six exhibitions with large sculptures in public space were curated by the Internationales Kuenstlerhaus, through private commitment as the Association of the Friends of the Villa Concordia and private donations as well as the support of the Oberfrankenstiftung it could be realized to purchase one work after each exhibition to be displayed permanently in Bamberg. 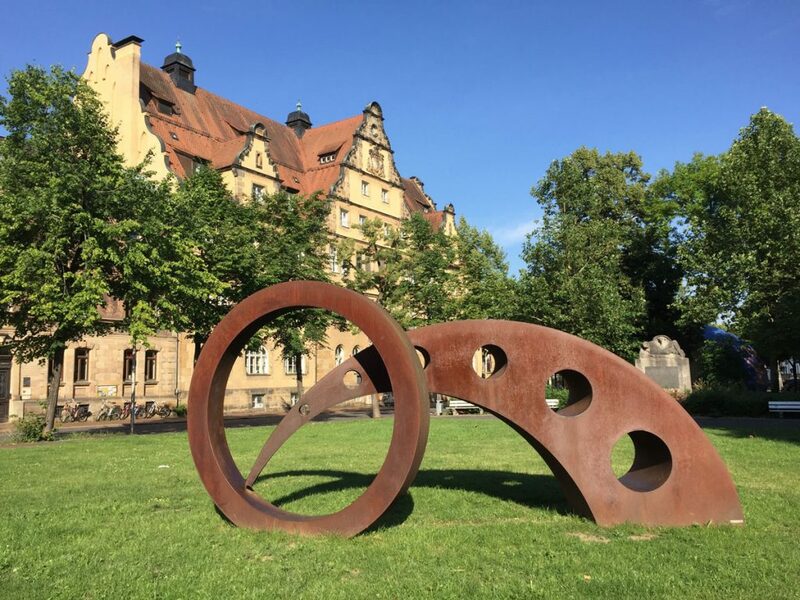 However, only few visitors know that Bamberg possesses such an outstanding sculpture path, as many of them predominantly come to Bamberg because of its picturesque historic centre. Exactly this is the problem of the city of Bamberg. Caught between Franconian beer Gemuetlichkeit and basketball art doesn’t take place in Bamberg. Bread and circuses absolutely suffice the representatives of the city, art which goes beyond this horizon is considered as dispensable luxury. But where does this obvious lack of interest in contemporary art exhibited by the town officials come from? Where does this considerable amount of uncertainty in stylistic questions come from, when the public space needs to be designed, where does this incompetence grown for decades come from, when contemporary art and design issues need to be responded to? Apparently there are serious structural deficits in the urban administration of Bamberg which have led to a collective cultural dementia. By resting on its art-historical wealth Bamberg falls culturally behind. Due to the fact that the Bishopric of Bamberg was dominated by the rule of the Catholic Church until the secularization at the beginning of the 19th century, an independent self-confident citizenry that was open for foreign or modern influences never had a chance to evolve. Thus it isn’t astonishing that the cultural development of Bamberg has ground to a halt since the beginning of industrialization and the advent of the modern era. Since then the culture of the city remains in a lethargic state, with tradition, stagnation and provincialism cross-fertilizing each other in a negative way. Nevertheless the geographic location offside the art capitals doesn’t need to be a reason to ossify in a provincial mindset. Kassel with the documenta and Muenster with the Skulptur Projekte have demonstrated, how provincial cities can be turned into international places of cultural exchange, at the highest professional level. But to achieve this one needs doers with visions and networks, who are unfortunately missing in Bamberg. At a regional level Bamberg is culturally left behind even by smaller cities such as Schweinfurt and Coburg in the meantime. The lack of visionary leadership and artistic competence always becomes obvious when the city council of Bamberg produces with somnambulistic confidence the most horrid solutions in matters pertaining to the design of public space. A misplaced striving for modernity and internationality constantly results in the unhesitating adoption of solutions that might work in major cities but which look awkwardly inappropriate and out of place in Bamberg. The Bamberg tube fountain – symbol of a failed cultural policy. Legendary is the Bamberg tube fountain which was placed directly in front of the baroque church of St. Martin’s in the newly built pedestrian zone in the 1970s. The fountain embodied the utopian world view of pure unadulterated modernism, a monster from concrete with technoid metal pipes. Public opinion in Bamberg boiled over, in this case people rightly felt bereft of their Franconian identity, the tin fountain was called “spaghetti organ“, “dynamic urinal“ or “degenerate fountain“. The city council who had approved the building unanimously under time pressure, hereupon meekly were looking for an insurance that covered political about-faces and accepted the damage of then 400.000 Mark. At the end of the day the failed journey to modernity was terminated and the fountain was torn down. 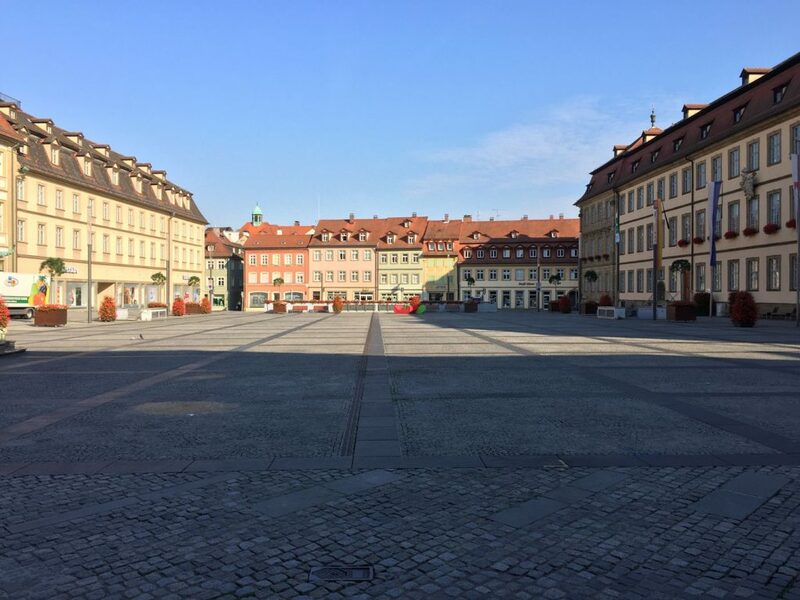 Another example of urbanistic planning failure that causes discussions until today is the appearance of the Maximilian’s square and its use. The amenity value of this square pretty much corresponds to a parade ground in the former German Democratic Republic. The Maximilian’s fountain from the 19th century which originally was located in the middle of the square was relocated to the outer rim of the square in the 1960s because of the construction of an underground car park with the result that the square has lost the balance of its architectural proportions and the fountain looks misplaced. A dead wasteland, where even the local marketeers don’t want to set up their stands, spreads since decades. The town officials and city marketing insist on using the square for major events for commercial reasons which rules out any aesthetic upgrading. What is more important for the cultural development of a city, to have ten big events at a low cultural level per year or 365 days with a high amenity value? To find a solution for both issues and to enliven the square, the city council has discovered the next big thing: mobile seating furniture, picked up from the Museumsquartier in Vienna, where the like colorful plastic boats looking design objects find themselves in a semi-public space and are frequented by a culturally open-minded audience. 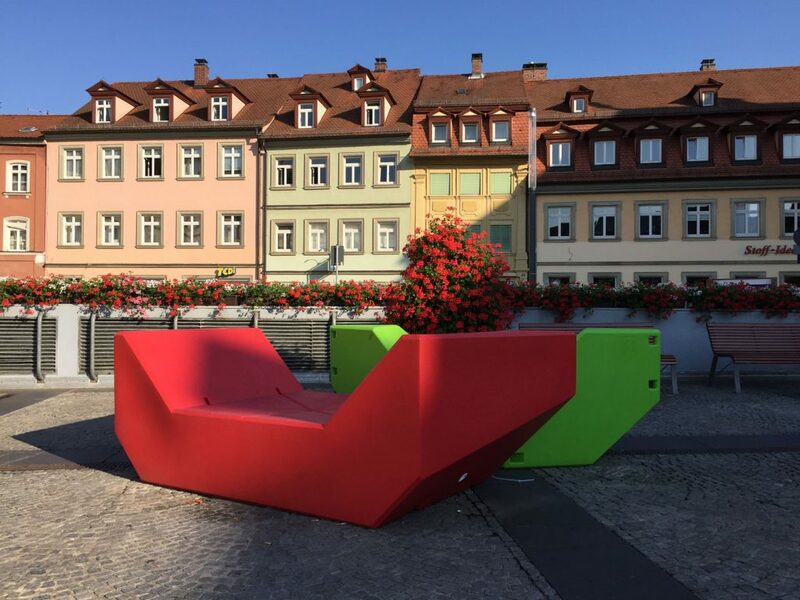 The situation at the Maximilian’s Square in Bamberg, however, is an official invitation to vandals to make the “Legos“, as the seatings are called in the vernacular, unusable as quickly as possible. This desperate striving for a metropolitan flair, in conjunction with narrow-minded thinking, as well as the dealing with the symptoms only is typical of the cultural policy in Bamberg. In the meantime contemporary artists hardly can find any exhibition opportunities in Bamberg. The Stadtgalerie Bamberg Villa Dessauer which has been used for the presentation of art since 30 years is let bleeding dry by the direction of the municipal museums, probably also in order to save the money for its refurbishment. Own exhibitions that are curated by the city officials actually don’t take place anymore, instead this cultural task is intended to be handed over to voluntary organizations. Thanks to the Kunstverein Bamberg and the Berufsverband Bildender Kuenstler Oberfranken contemporary art is still presented at all in Bamberg, but also here there is a lack of financial and moral support from the officials. 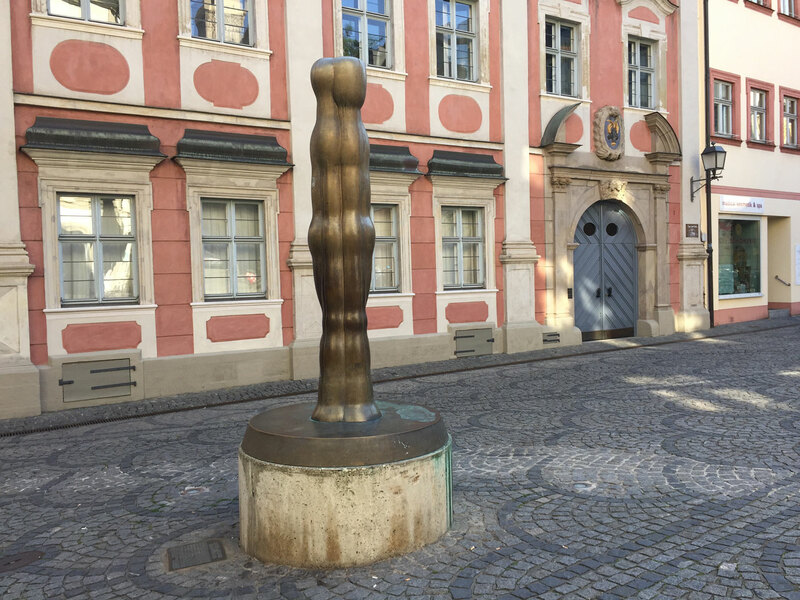 The little importance the city of Bamberg attaches to contemporary art is reflected in the fact that official representatives of the city constantly are conspicuous by their absence at openings. As a result Bamberg is slowly but surely losing ground from a cultural perspective compared to other cities of the region despite its rich cultural heritage. Kunstraum Kesselhaus or Villa Dessauer? Bamberg needs space for contemporary art. 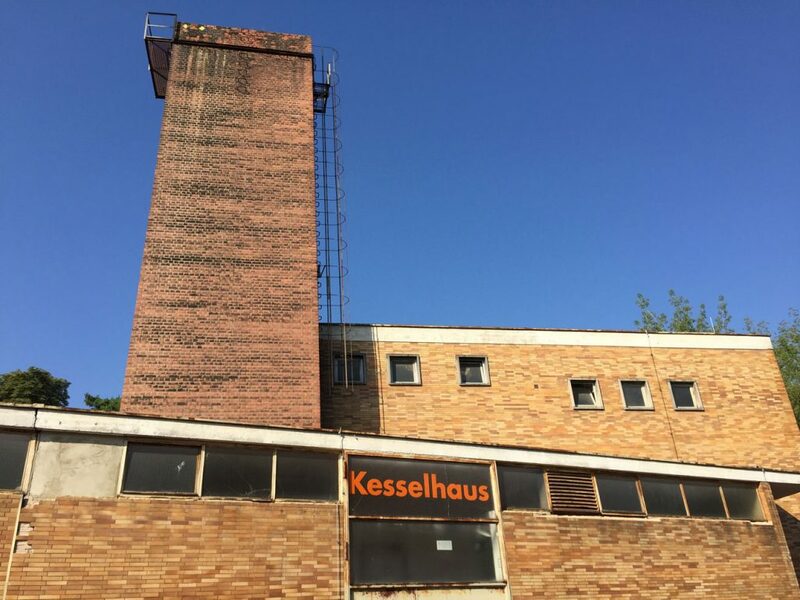 The shut down heat station of the former hospital, the Kesselhaus, is used to display contemporary art since 2011, with its morbid charm the industrial building is ideal for the presentation of installations. The Kesselhaus is used by the society Kunstraum Jetzt!, an association of Architekturtreff, Kunstverein Bamberg and the Berufsverband Bildender Kuenstler Oberfranken. Between 2013 and 2015 the Kesselhaus was shut down again at the instigation of the city of Bamberg, with fire protection and security being pretended as reasons. The costs of the construction measures which were considered to be mandatory for the continued use as exhibition place were deliberately exaggerated. Not before the competent intervention of the Architekturtreff the estimated costs could be reduced to a realistic amount and the minimal requirements for the protection could be fulfilled. The use and occupation contract with the city expires in 2021, in addition the Kesselhaus cannot be used during the winter time as there is no heating. From an officials point of view the use of the Kesselhaus as exhibition place is rather tolerated than promoted. Cultural promotion looks different, especially if it’s about the support of voluntary organizations. 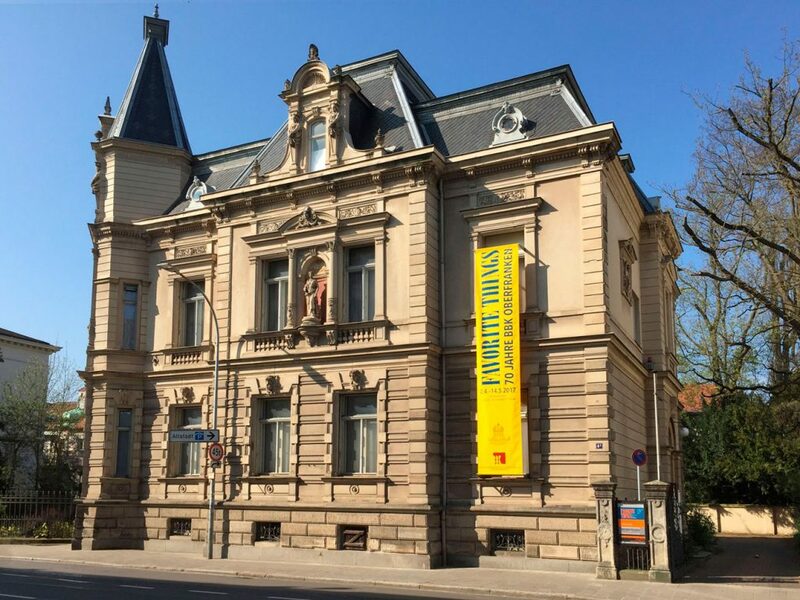 So it’s not surprising that the Kunstverein has to do without an office of its own since decades, a look at other Bavarian cities such as Wuerzburg demonstrates how helpful support can be. Not much better is doing the Berufsverband Bildender Kuenstler Oberfranken, who was made a moldy cellar in the Stadtgalerie Bamberg Villa Dessauer available by the city of Bamberg. 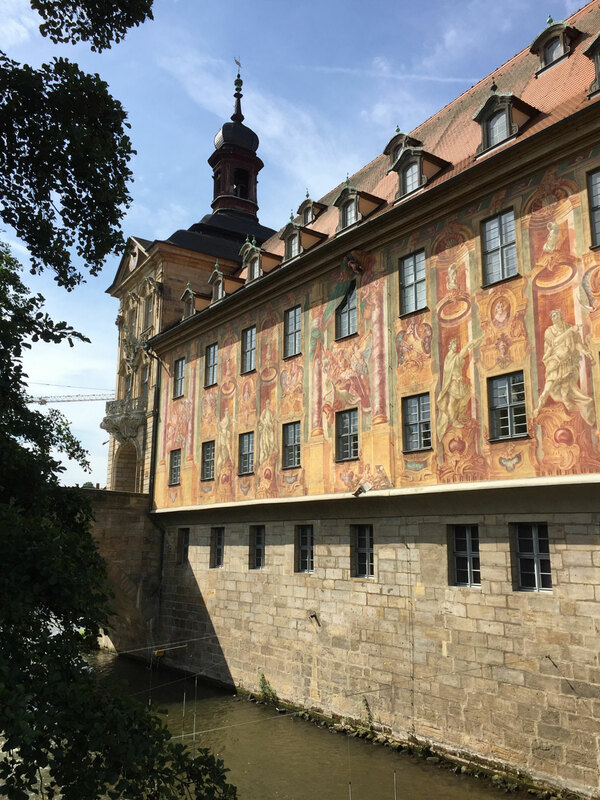 An emancipation from the world heritage hasn’t been successful in Bamberg so far, for decades is hasn’t been considered to be necessary to invest in contemporary art, instead exclusively commercial interests were taken into account to increase the number of tourists. Since the turn of the millenium this number has approximately doubled which leads increasingly to conflicts with the local people in the meantime, the touristification which overruns Venice or Barcelona has also arrived in Bamberg. The interest of local culturally open-minded citizens in temporary exhibitions isn’t taken into account by the city officials, the education mandate to develop museum educational services for pupils is ignored. To accomplish this qualified staff is required which is of course a cost factor. As contemporary art is considered as a dispensable leisure activity of a small minority by the officials in Bamberg, all cultural areas are affected by budget cuts, due to the staff shortage the closing times of the municipal museums are so extended in the meantime that they don’t play any role anymore in the public perception. Culture as a location factor beyond tourism doesn’t mean to go to the beer cellar. In the meantime culture has become a location factor, the importance of the creative industries is increasing, but qualified staff can be won only, if the city makes appropriate offers and has a multifaceted cultural life at all levels. Bamberg has a vivid subculture indeed, but when it’s about inter-regional radiation the bell jar of the world heritage closes over the city. Art fosters the dialogue, opens new perspectives and helps to build up creative networks. A provincial mindset, however, results in brain drain. The development of the city of Muenster shows parallels to Bamberg, with the numerous churches that shape the cityscape, the ultraconservative attitude of the population and the geographic location offside neighbouring major cities. However, due to the realization of the Skulptur Projekte which take place every ten years, in this year for the fifth time since 1987, Muenster has evolved into a cosmopolitan city. After the first edition of the Skulptur Projekte still had been perceived as a provocation by the citizens, today the city is proud of being mentioned in the same breath with the documenta in Kassel and the Biennale in Venice. Bamberg possesses world-class artworks, but to use them for a high quality sustainable tourism and the local citizens in a positive way at the same time, a comprehensive concept for all museums and cultural organizations in Bamberg is required, otherwise Bamberg will continue to fall behind compared with other cities in the region. The subsequent sculpture path shows, how exciting the dialogue between the history and the present can be. But the impression that the city officials of Bamberg have contributed to this is misleading, as the presence of contemporary sculptures is owed to an initiative of the Free State of Bavaria, who has brought the Internationales Kuenstlerhaus Villa Concordia to life, as well as the private voluntary commitment of some citizens who are interested in art. Instead the city council of Bamberg continues to dream of the creative quarter at the Lagarde barracks which appears at least two sizes too big without concept, competence and experienced doers from the art world. A lot of water will flow down the river Regnitz, until something will change in Bamberg, which means that the brain drain will go on. 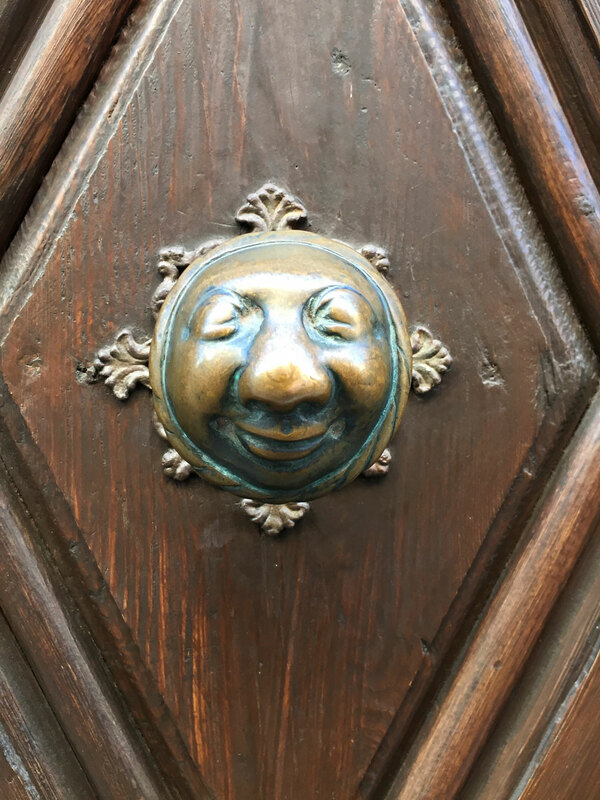 The creators of Bamberg will continuously be forced to try their luck abroad, and the others who are determined to stay nevertheless have put up with it long ago that the cultural history of Bamberg ends with the Baroque and the invention of the beer cellar. The Bamberg sculpture path is kept top secret by the city officials. 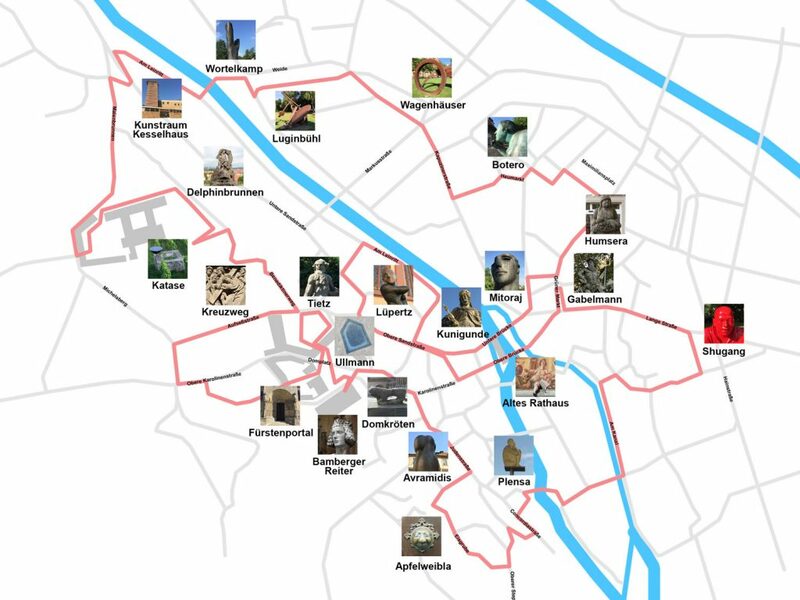 The route of the following sculpture path leads to works of art from the 11th century to the present and reveals the wealth of Bamberg with its most beautiful places of interest, but hidden gems in the medieval and baroque historic centre as well. The sculpture path starts and ends at the Kunstraum Kesselhaus at the Leinritt opposite of the concert hall. On the one hand the underground car park with its convenient transport connection is easy to reach for visitors, on the other hand the Kunstraum Kesselhaus has a highly symbolic importance for contemporary art in Bamberg and the way how the representatives of Bamberg treat art in general and their artists in particular. The Benedictine Abbey St. Michael’s was founded in 1015 at the Michaelsberg, the cultivated landscape is intact still today to a far extent. In the 17th and 18th century the originally romanesque site received its today’s predominantly baroque design, after Johann Leonhard Dientzenhofer had been commissioned to build a new abbey in 1696. The gardens with the terraces and pavilions were designed by Balthasar Neumann, Johann Jakob Michael Kuechel und Conrad Fink from 1745 to 1752. Under Abbot Gallus Brockard the Dolphin’s Fountain was created by an unknown baroque artist on the middle axis of the lower abbot’s garden between 1759 and 1767. 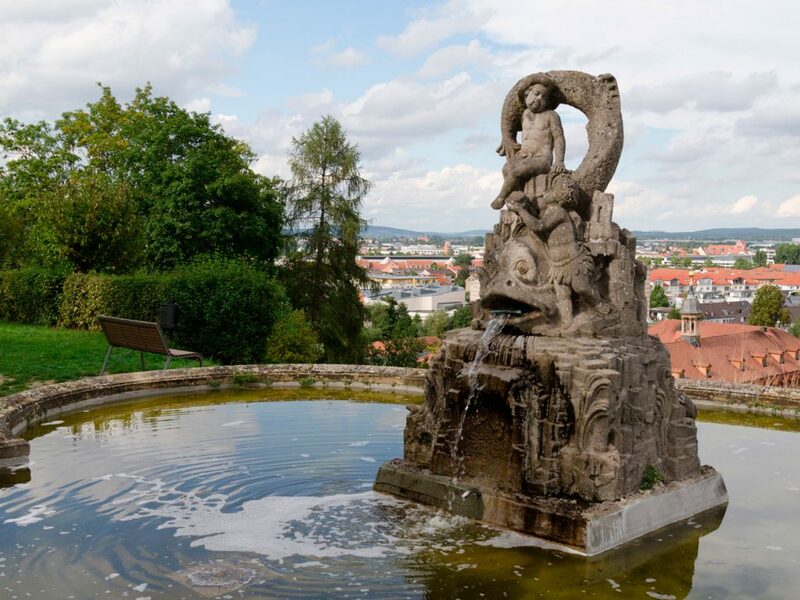 The Dolphin’s Fountain, also called Whale’s Fountain, is located in the area of the “forbidden gardens“ at the Michaelsberg and bears the coat of arms of former Abbot Gallus Brockard. In the context of the International Artists Exchange celebrating the millenial anniversary of the Diocese of Bamberg which was carried out by the Internationales Kuenstlerhaus Villa Concordia in 2007, the invited artists could select a location in public space, where they could realize an artwork. Japanese artist Kazuo Katase (born in 1947) who lives in Germany since many years went for the former vineyard at the Michaelsberg which has been recultivated today. 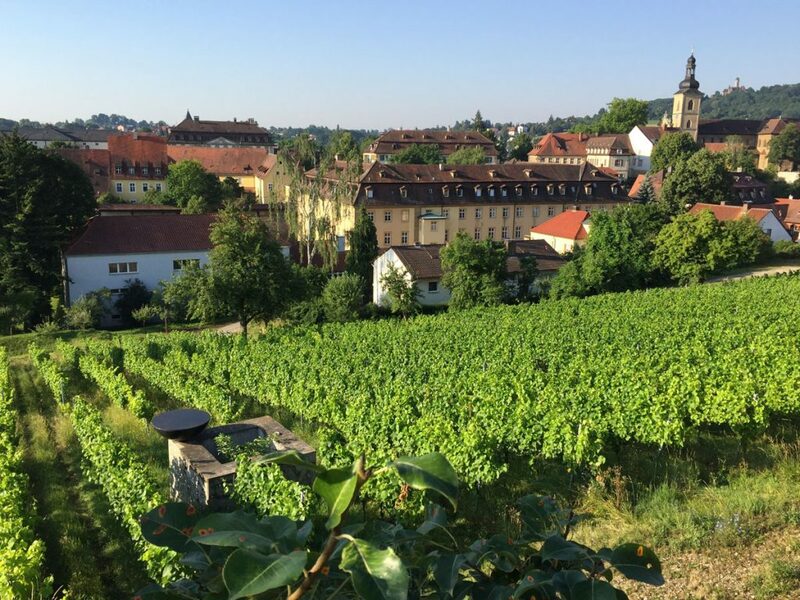 On the hillside of the Benedictine Abbey St. Michael’s wine was cultivated in the so-called Kamerathengarten by Bishop Eberhard since its foundation. Katase created a dry fountain with the title Transfiguration, he got inspired both by the history of winegrowing and its liturgical importance as well as the ceiling fresco in the church of St. Michael’s, where 600 medical plants, among them a vine, are depicted. Vines are cast in the square dry fountain from concrete, an oversize dish from granite is placed on one corner. The Bamberg Way of the Cross between the hospital church St. Elizabeth’s and the provost’s church St. Getreu from 1503 is the oldest entirely preserved Way of the Cross in Germany. Presumably is was donated by Knight Heinrich Marschalk von Ebneth zu Rauheneck who entertained business relationships with the Benedictine Abbey St. Michael’s. 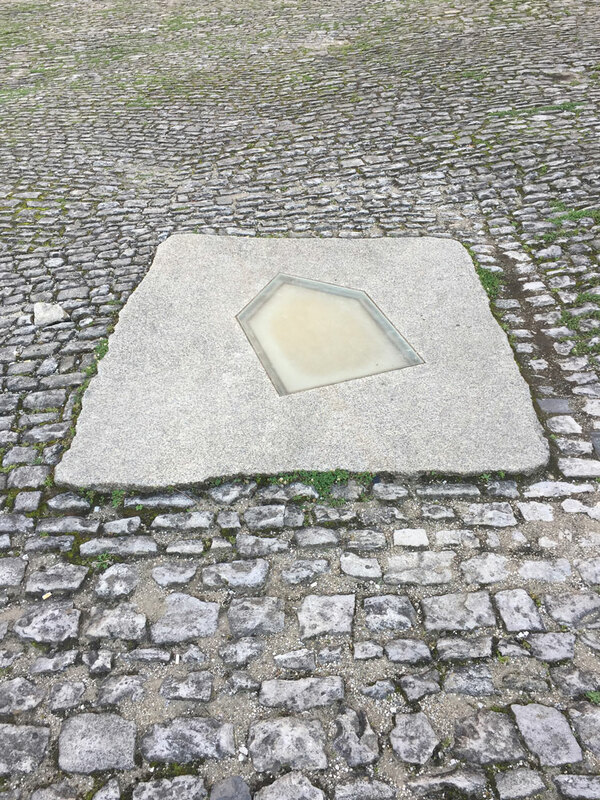 Tradition has it that he counted the number of steps between the Stations of the Cross during a pilrimage to Jerusalem and transferred it to the situation at the foot of the Michaelsberg. Each station bears an engraving how many steps the house of Pilate is away. Between 1500 and 1503 Marschalk von Rauheneck donated Friday’s masses in both churches which represent the start and the end of the Way of the Cross, therefore it’s assumed that it was created by an unknown artist during this time. The seven stations were meant to describe the believers the suffering of Jesus Christ to enable them to participate in prayer by striding along a copy of the Via Dolorosa. 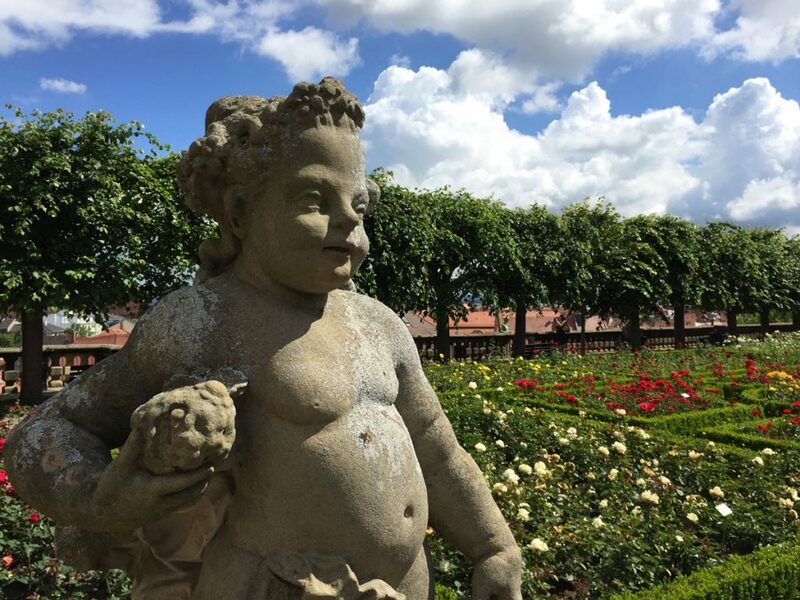 The Bamberg Rose Garden originally was a Renaissance garden, in 1733 Prince-bishop Friedrich Karl von Schoenborn commissioned Balthasar Neumann to turn it into a baroque garden, the formal basic structure of which can be recognized still today. The Bamberg court sculptor Ferdinand Tietz (1708-1777) was responsible for the sculptural decoration. Tietz was one of the most important sculptors of Southern German Rococo and created the architectural sculptures for the Wuerzburg Residence and the Seehof Palace near Memmelsdorf. 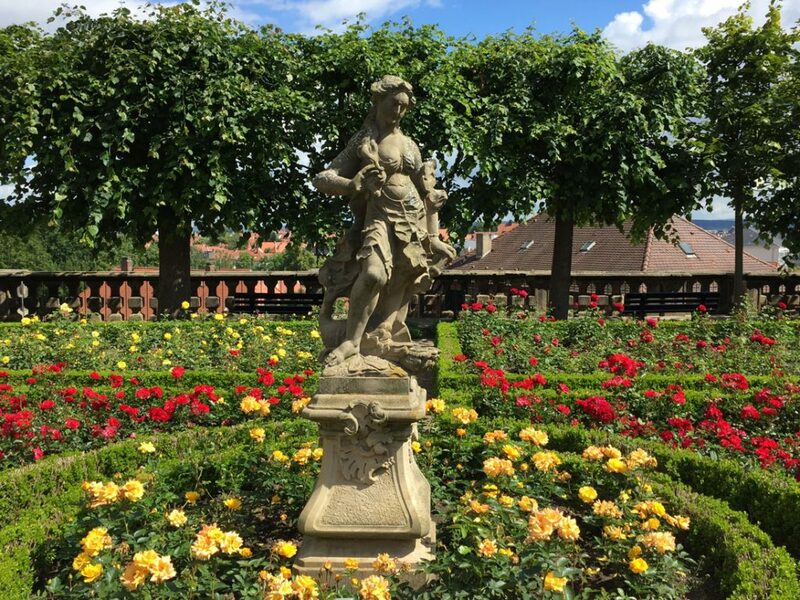 The sculptural program of the Bamberg Rose Garden was created between 1760 and 1761 and was inspired by Greek mythology, the statues that have been preserved represent the Roman gods Jupiter, Juno, Neptune, Apollo, Venus and Ceres, the puttos are allegories of the virtues and the music. The works by Ferdinand Tietz are characterized by a playful handling of the relationship between art and nature as well as voluminous garments which create strong light and shadow effects. At the initiative of Duchess Maria Anna a rose garden with 500 rose trees was planted in the 19th century, today about 5000 roses in 50 sorts are growing there. Until the 18th century there was a column with a figure of Christ on the Cathedral Square, called Tattermann in the vernacular, which represented the hub of the universe and the centre of the Holy Roman Empire of the German Nation. 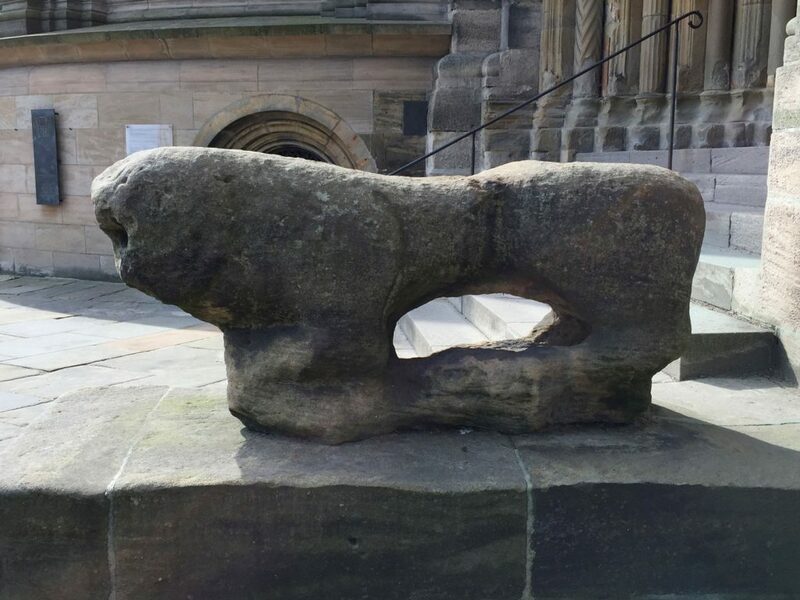 In the context of the millenial anniversary of the Diocese of Bamberg in 2007 Isreali artist Micha Ullmann (born in 1939) who has roots in Bamberg created a negative column that has been milled into one block of granite and was sunk into the ground of the Cathedral Square. It is covered by a glass plate in the shape of a house the top of the roof of which points in the direction of Jerusalem. When the viewer looks into the column the towers of the cathedral and the sky are meant to be reflected, thus making the viewer recognize himself as Tattermann. Unfortunately the concept of this work of art must be considered to have failed as the glass plate always is blind through condensation water and none of the intended effects are accomplished. 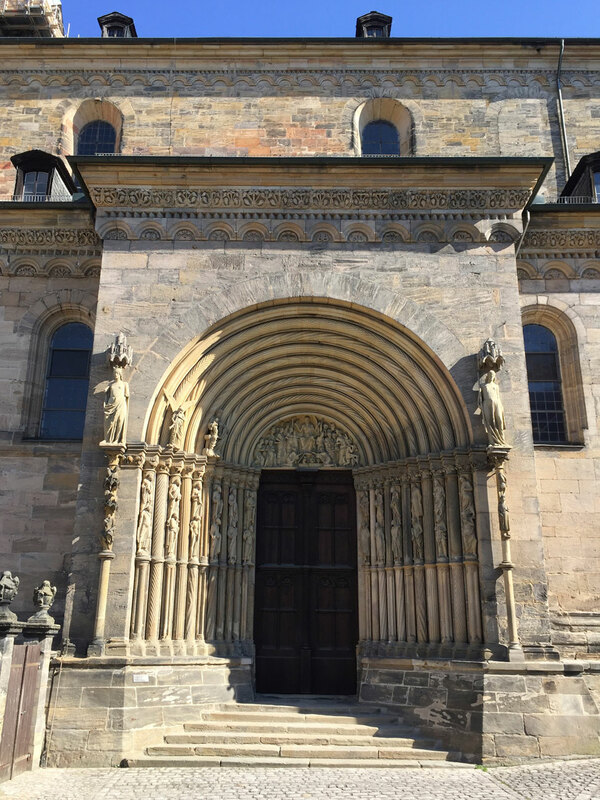 The Portal of the Princes is one of the four main portals of the Bamberg Cathedral St. Peter’s and St. George’s and dates from the 13th century. Its use was reserved for high-ranking clerics who were secular princes at the same time. The imagery starts at the left side with life and ends at the right side with death. In the tympanum in between the Last Judgement is depicted that admonishes the believers not to go astray. The female figures represent personifications of the Old Covenant (Synagogue representing Jewry) and the New Covenant (Ecclesia representing the church). Ecclesia is positioned on the side of the blessed with a crown posing triumpantly as a sign of the victory over the Old Covenant. On the right side next to the condemned stands Synagogue blindfolded as a symbol of the blindness not to recognize Jesus Christ the Messiah. The Tablets of the Law slip from her left hand. In front of the semicolumns the twelve little prophets are enthroned who carry the twelve apostles on their shoulders. 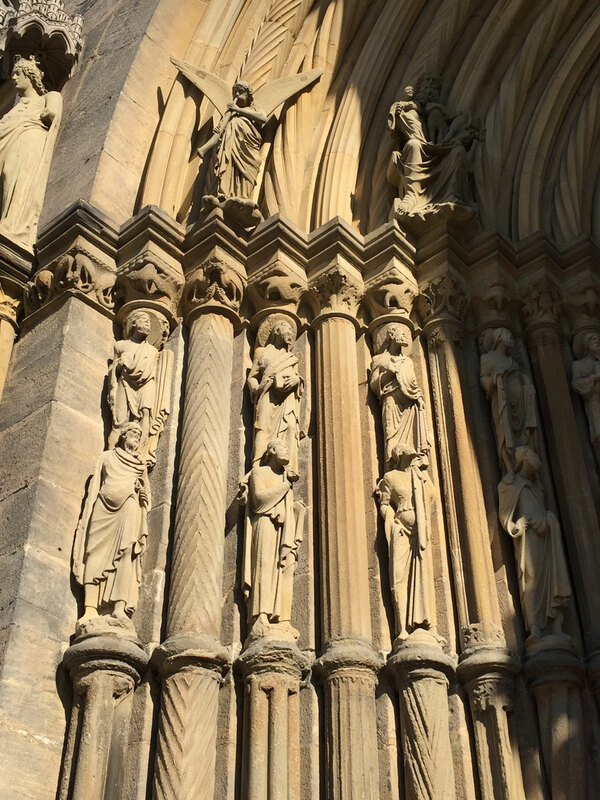 On the right-hand side of the tympanum there is the figure of Abraham with five blessed in his bosom and the angel with the trumpet. Two lions from the 11th century that resemble more chimeras than heraldic animals watch over the romanesque portals of the Bamberg Cathedral. They are the last remnants of the Heinrich’s Cathedral which burnt down at the end of the 11th century for the first time and was torn down after a second fire in 1185. Legend has it that the devil had sent the two monsters together with a lindworm in order to sabotage the erection of the cathedral. At night the chimeras which were half toads and half lions undermined the building to cause it to collapse. After the lindworm had been banished, the giant toads turned into stone. In the vernacular the naming of the cathedral steps, the Domgreden, was transferred to the stone sculptures, turning them into cathedral toads (in old German Grede/step sounds like Kroete/toad). 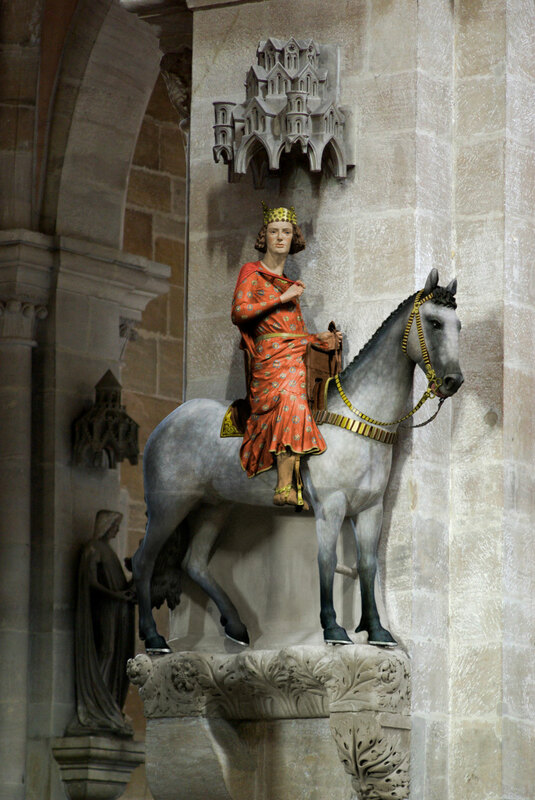 The importance and identity of the Bamberg Horseman ist puzzled over until today, the sculpture which assumably has been set up in 1237 on the occasion of the consecration of the newly erected cathedral is the only known equestrian statue in a church interior. Moreover it is one of the first depictions of a shod horse. 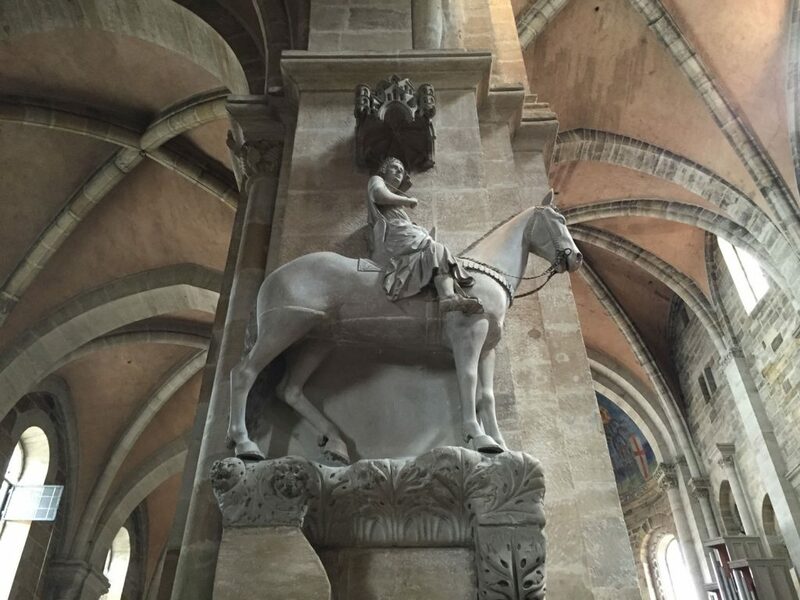 As a result of the most recent research the Bamberg Horseman has kept his location since the 13th century, fictitiously he came ridden into the cathedral through the Portal of Princes in order to pay homage to the tomb of the imperial couple turned towards them. Originally the statue was painted, the horse was dapple grey, garment and cape were red with silver and golden stars and the crown was gold plated. Consistently the figure of the horseman is associated with Stephan I of Hungary, as he was the brother-of-law of Emperor Heinrich II. Also the family relationships of Bishop Ekbert of Andechs-Meranien during whose term of office the sculpture was presumably commissioned point to Hungary. Historians see this as a thanksgiving for the asylum, Ekbert was granted by Andreas II after the murder of the king in 1208 until his rehabilitation. The Bishopric of Bamberg had possessions throughout Europe in the 13th century, among them in Hungary. Legend has it that Stephan came on horseback directly ridden into the cathedral when he visited Bamberg for the first time, as he wasn’t familiar yet with the Christian conventions being a pagan. 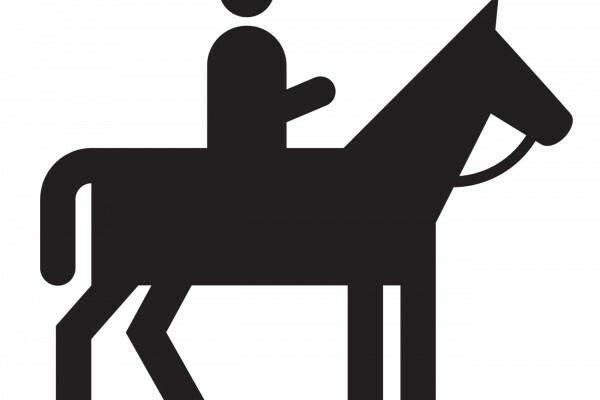 According to that the horse could also symbolize the Hungarian equestrian people of the Huns. After the exhibition of bronze sculptures by Joannis Avramidis (1922-2016) in 1999 the Large Figure 1982 was acquired and placed on the Pfahlplaetzchen. Joannis Avramidis was of Greek descent and was born in Georgia, as slave labourer he was abducted to Vienna in 1943, where he studied at the Academy of Fine Arts later on. After having been spotted by Fritz Wotruba, Avramidis emerged to one of the most important sculptors in Austria. His work is focused on the human figure which he turns into monumental round sculptures in an abstract approach. Mostly his sculptures are built from segments of a circle which he condenses into slender steles, keeping their Greek and archaic influences visible despite their abstract appearance. In 2012 the exhibition 8 Poets for Bamberg of Catalan artist Jaume Plensa (born in 1955) was presented. The eight poets were sitting or crouching male figures from fibreglass who towered on six meters high steel steles. Removed from reality they shimmered in white during the day, after sunset they were glowing from within in changing colours by means of integrated LED-lamps. The figure titled Air-Earth that was placed at the Obere Muehlbruecke was purchased by the Association of the Friends of the Internationales Kuenstlerhaus Villa Concordia with the support of donors and sponsors. Jaume Plensa who lives in Barcelona ranks among the most renowned international sculptors and has realized large sculptures in public space throughout the world, such as Chicago, Dubai, London, Liverpool, Marseille, Tokyo, Toronto and Vancouver. By combining classical sculptural materials like steel, bronze and aluminium with different media like water, light, sound and video, with text also being included frequently, he creates sculptures of a strong psychological intensity. 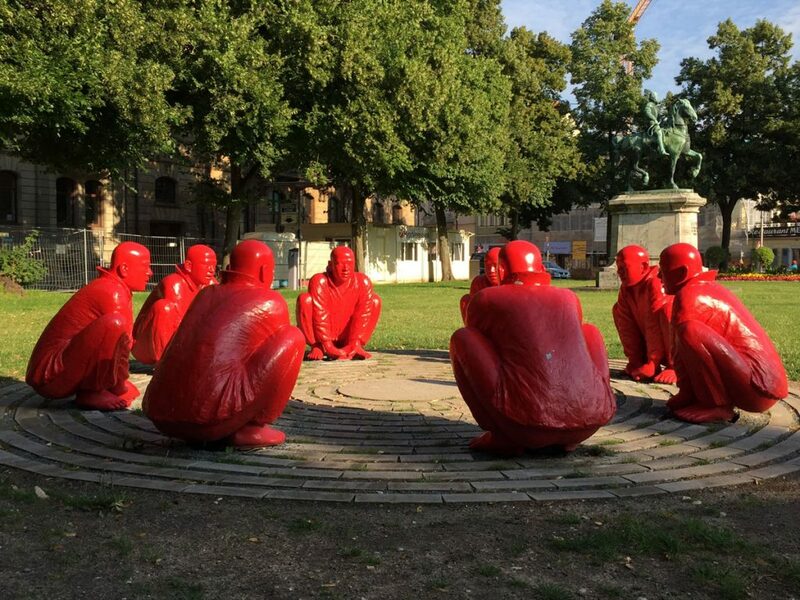 Meeting is the title of the work by Chinese artist Wang Shugang (born in 1960) which consists of eight red painted bronze men who are squatting in a circle. In 2013 the figure group was presented in Bamberg for the first time in the context of the art exhibition Circles, thanks to private donations and the commitment of local companies the work could be acquired by the Association of the Friends of the International Kuenstlerhaus Villa Concordia in 2016 and permanently displayed on the Schoenleinsplatz. In 2007 Meeting was presented on the occasion of the G8 summit in Heiligendamm in Germany and stands for the new relationship between Germany and China. The number eight is the Chinese lucky number and the squatting a habit of the poor people. 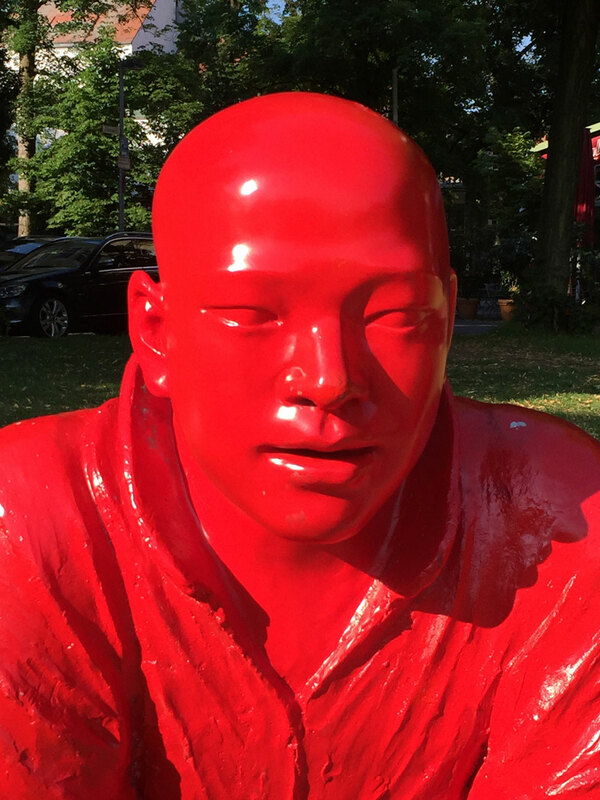 The colour red doesn’t only represent Chinese reality such as the colour of wedding dresses, but is a commemoration of the blood that was shed during the massacre on the Tiananmen Square at the same time. The serial character of the figures points to the uniformity and censorship many artists suffer from in China. Ludwig Krug, councilman in Bamberg, bequeathed his home town 800 gulden in the 16th century to erect a fountain. 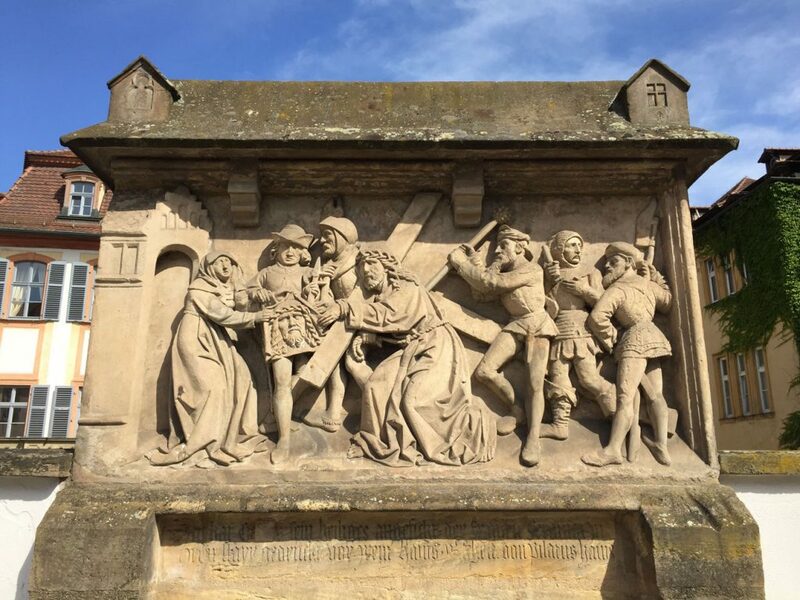 However, not before the year 1566 his last will was fulfilled by the council of the city of Bamberg by commissioning Master Jorg Walbergk of Dressen to build a fountain. The fountain existed since 1337 already and received a statue of Saint George now, the former patron of the city. In the course of the centuries frequent renovations had to be carried out, with the water system causing constantly problems. In 1698 the fountain received its today’s appearance with the depiction of roman god of the sea Neptune which was designed by Caspar Metzner. The inscription on the plinth L.F.D.G.S.S.M.A.S.R.I.P.G.A.E.E.E.B. 1698 means Lotharius Franciscus Dei Gratia Sanctae Sedis Moguntinae Archiepiscopus Sacri Romani Imperii Per Germaniam Archicancellarius Et Elector Episcopus Bambergensis 1698 the translation of which means: “Lothar Franz, by grace of God Archbishop of the Holy Seat of Mainz, Lord Chancellor of the Holy Roman Empire of the German Nation and Elector, Bishop of Bamberg”. On initiative of the Elector the fountain was modernized in 1697. 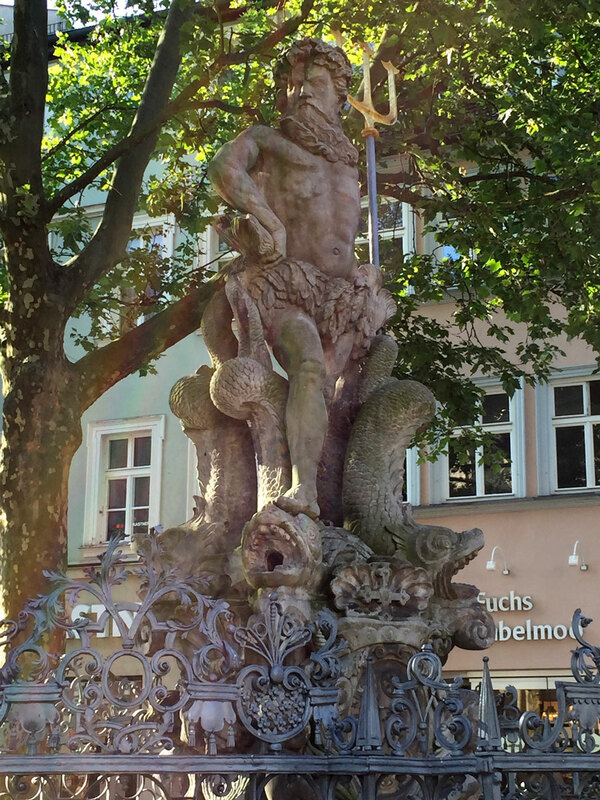 In Bamberg the Neptune’s Fountain is just called Gabelmann (man with the fork) or in Franconian Goblmoo. The Old Town Hall is located in the middle of the River Regnitz. Tradition has it that the bishop of Bamberg refused to concede a building site to the citizens in order to erect a town hall. Consequently the citizens rammed piles into the middle of the river and filled up an artificial island, where they erected their town hall. 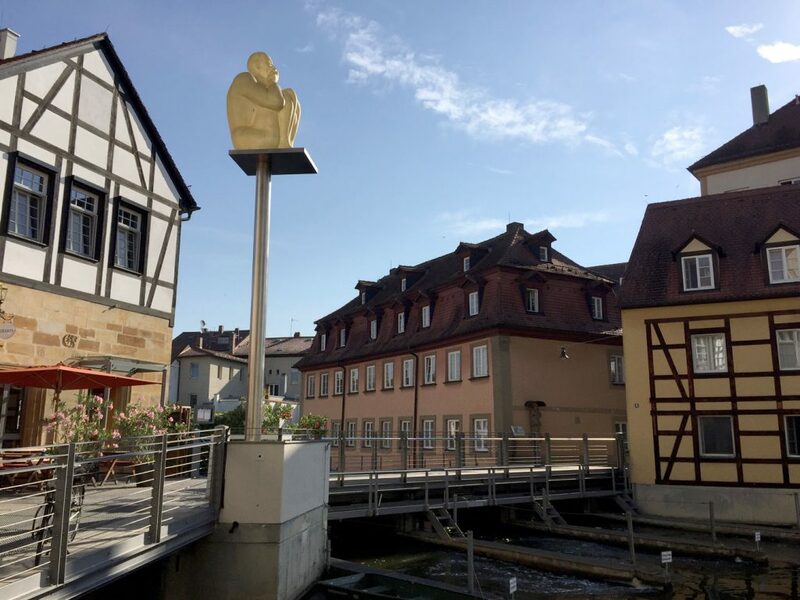 The position of the town hall in the middle of the river Regnitz represents the border that separated the territory between the episcopal town on the hills and the civic town on the river island and symbolizes the claim to power of the emerging citizenry. In 1387 the town hall was mentioned for the first time, between 1461 and 1467 it was rebuilt in the gothic style and between 1744 and 1756 it was redesigned by Johann Jakob Michael Kuechel in the styles of Baroque and Rococo. 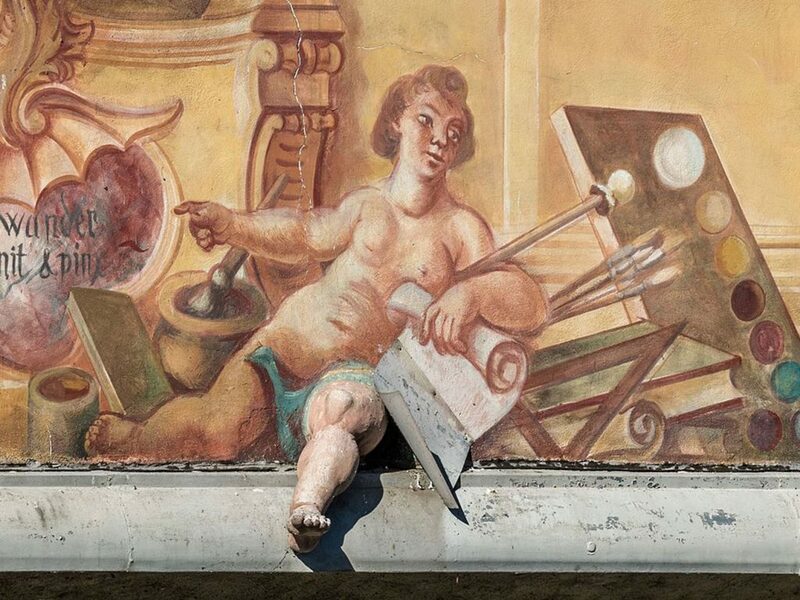 Remarkable are the frescos on the outer façade which were created by Johann Anwander in 1755. Due to the weather effects there was not much left of the paintings around 1950, between 1959 and 1962 they were reconstructed by Anton Greiner. The façades of the Old Town Hall depict allegorical scenes that were typical of the baroque period, in order to enhance the architectural illusionary imagery, some of the architectural elements were shaped as three-dimensional objects. One curiosity of the baroque play with illusion and reality is the leg of one of the puttos which sticks out from the wall as a sculptural three-dimensional object and dangles from the cornice. In 2006 the Internationales Kuenstlerhaus Villa Concordia organized an exhibition of 13 large sculptures by Markus Luepertz (born in 1941) in collaboration with the Galerie Michael Werner. Markus Luepertz who co-founded the legendary artist-run gallery Grossgoerschen 35 in 1964 and was rector at the Staatliche Kunstakademie in Duesseldorf from 1988 to 2009 ranks among the most well-known German artists of the postwar period. His works are characterized by their archaic monumentality, often they are inspired by classical ancient design principles. 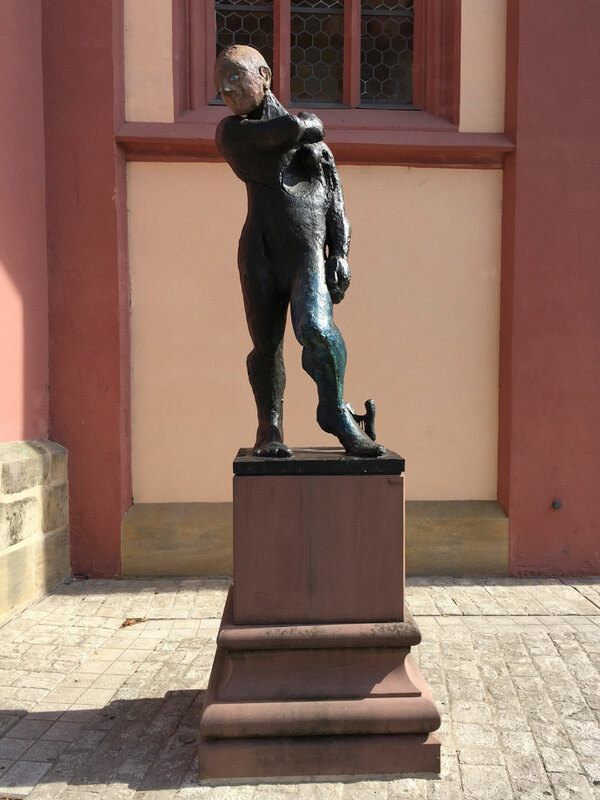 From 1980 on he tranferred the neo-expressive style of his painting to sculpture as well, in 1989 he designed the figure of Apollo for a niche of the Alte Oper in Frankfurt which was cast in bronze in a limited edition of six copies. After the exhibition in Bamberg the Apollo by Luepertz was purchased by the Association of the Friends of the International Kuenstlerhaus Villa Concordia with the support of donations and was set up in front of the hospital church St. Elizabeth’s in the Obere Sandstrasse. The Apollo plays with various quotations from art history such as the lyre and the classical posture featuring support leg and free leg as well painting the bronze in colours that remind of Greek sculptures. 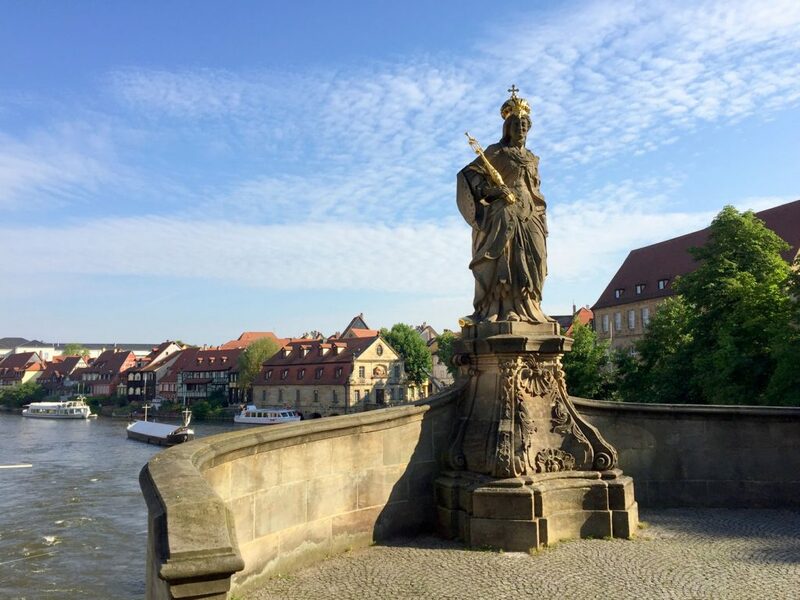 The stuatue of Saint Kunigunde on the Untere Bruecke was created by Bamberg court sculptor Johann Peter Benkert (1709-1765) in 1750. She is the only one of six bridge figures that has survived the devastating flood from 1784. In 1783 geomorphologic activities of the earth caused worldwide volcanic eruptions which changed the climate dramatically for several years. As a result in 1783 there was the most severe and snowy winter since 500 years, due to the snow melting in spring 1784 a flood and the force of huge ice floes destroyed or damaged countless brighes throughout Central and Northern Europe. In Bamberg the famous Seesbruecke and the Untere Bruecke fell victim to the once-in-a-millenium flood. Heinrich and Kunigunde are the only holy imperial couple in Catholic history. Kunigunde was the daughter of Count Siegfried I of Luxemburg, in 999 she married Duke Heinrich IV of Bavaria, in 1014 the couple were crowned Roman-German Emperor end Empress by Pope Benedict VIII. As regards the Middle Ages Kunigunde was a very emancipated woman, she participated in her husband’s affairs of state, took care of the poor and the sick, built hospitals, organized campaigns and was to a large extent responsible for the production of art that was created at her court. After Heinrich’s death in 1024 she took over the regency until her candidate of choice, the Salian Konrad, was elected the new German king. The Kunigunde’s path was a historic connecting path of the Benedictines from the 9th century and was used regularly by Kunigunde to visit her landed territories. The path connected Aub and Bamberg and was an important economical, political and religious connecting route. Later on the Kunigunde’s path was very popular with pilgrims who pilgrimaged to the tomb of the imperial couple in the Bamberg Cathedral. Polish sculptor Igor Mitoraj (1944-2014) follows the works of the ancient world and is influenced by Michelangelo and Antonio Canova. Often his figures are rooted in Greek and Roman mythology such as Ikaros, Centauro, Eros or Mars. Mitoraj’s sculptures are characterized by the deliberate use of fragments, both in his busts and in his torsi. The surface of his marble and bronze sculptures is intentionally damaged and covered with cracks, entire body parts are missing in order to point out to the fragility of human existence and the irreversable decay of matter. 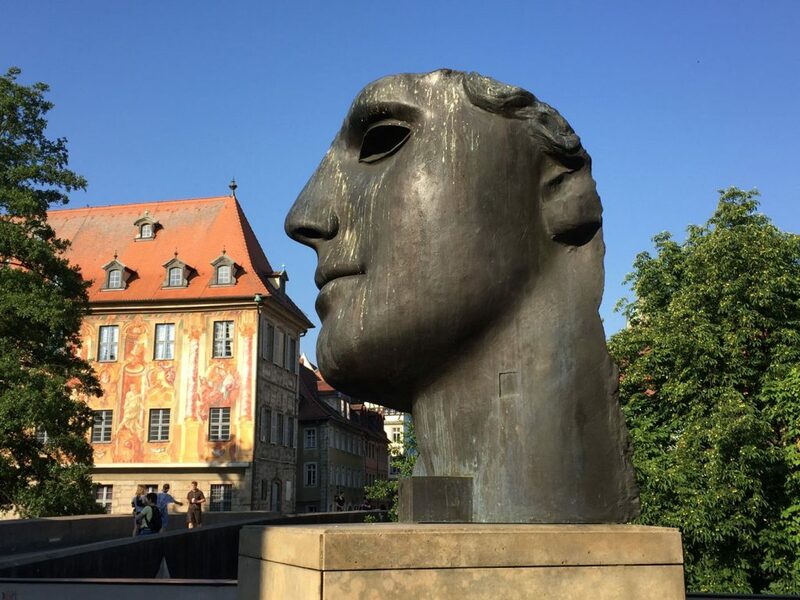 In 2000 large sculptures by Mitoraj were exhibited in Bamberg, the sculpture Centurione I from 1987 was acquired by the Association of the Friends of the International Kuenstlerhaus Villa Concordia with the support of private donations and set up at the Untere Bruecke. The bronze sculpture Centurione I represents the fragment of a head that mirrors the classical ideal of beauty, but due to deliberate damages and the missing of the cranium the face turns into a symbol of the imperfection and vulnerability of man at the same time. 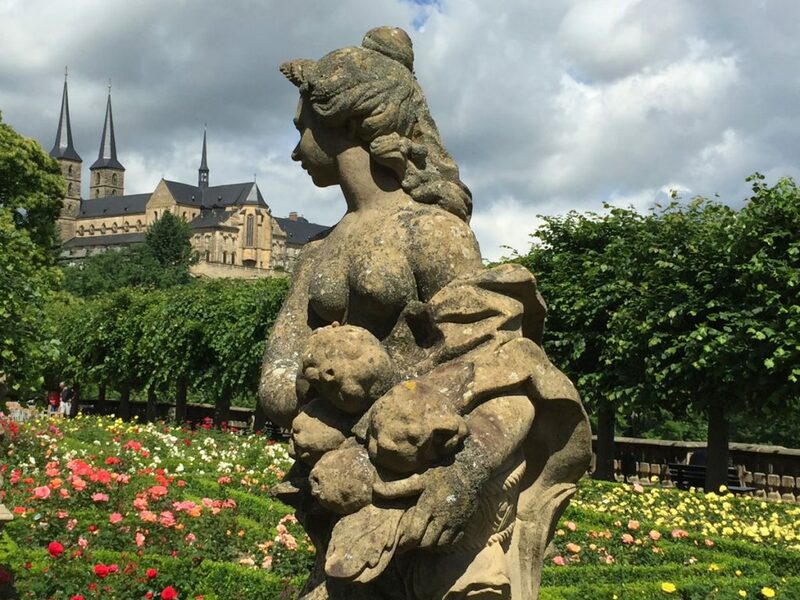 His history of Bamberg is inseparably connected with its 700 years old tradition of gardening. The Humsera was a market-woman and a real character who was notorious for her loose tongue. A rough tone was common among the market-women as they didn’t want to sell their produce which they had harvested with hard farm work underprice when they haggled about it. Tradition has it that the Humsera was so vulgar that she even spoilt things with her fellow gardeners. The name Humsera goes back to the name of the gardener family Hums who lived in the Heiliggrabstrasse. 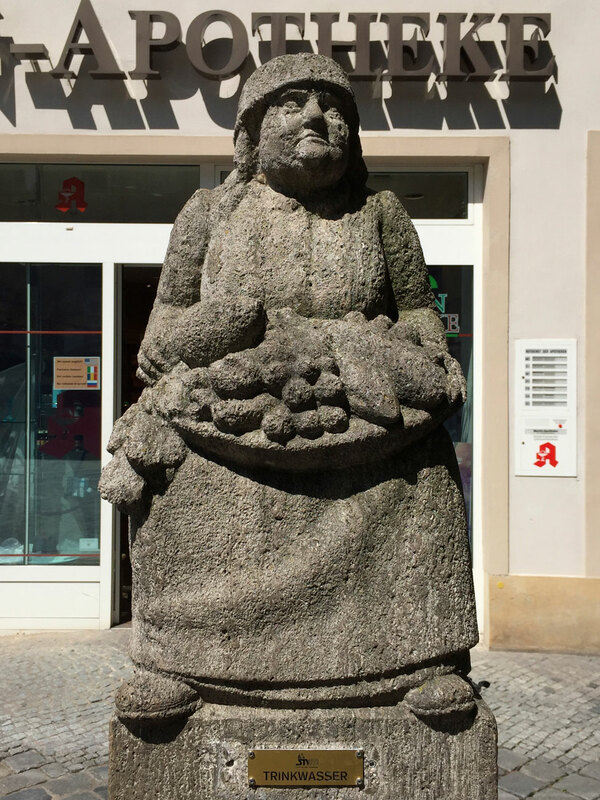 With his fountain sculpture from 1933 at the Gruener Markt sculptor Hans Leitherer (1885-1963) from Bamberg has erected a memorial in honour of the market-women who are called Markthoecken (market squats) in the Bamberg vernacular. In 1998 the first exhibition that was organized by the Villa Concordia presented large sculptures by Colombian painter and sculptor Fernando Botero. Botero was born in Medellín in 1932 and ranks among the most famous artists of Latin America. He occupies himself with the human body and exaggerates the proportions of it in his figurative depictions. Botero’s figures are characterized by their voluminous opulence, he uses this stylistic device to explore the space and the sensual presence of the form, but at the same time also to criticize the degenerate colonial bourgeoisie. 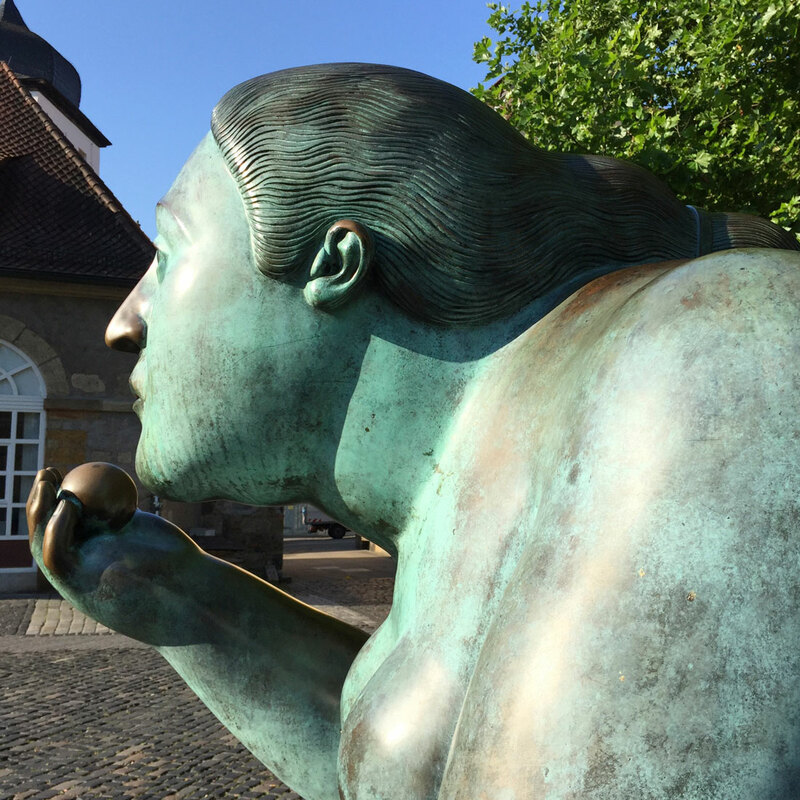 The sculpture Reclining Woman with Fruit was purchased after the exhibition with the support of private donations and was raised on the Heumarkt. In 2005 the idea to exhibit the Reclining Woman with Fruit on a swimming pontoon in the river Regnitz facing the Old Town Hall was put into action and failed in a spectacular way. 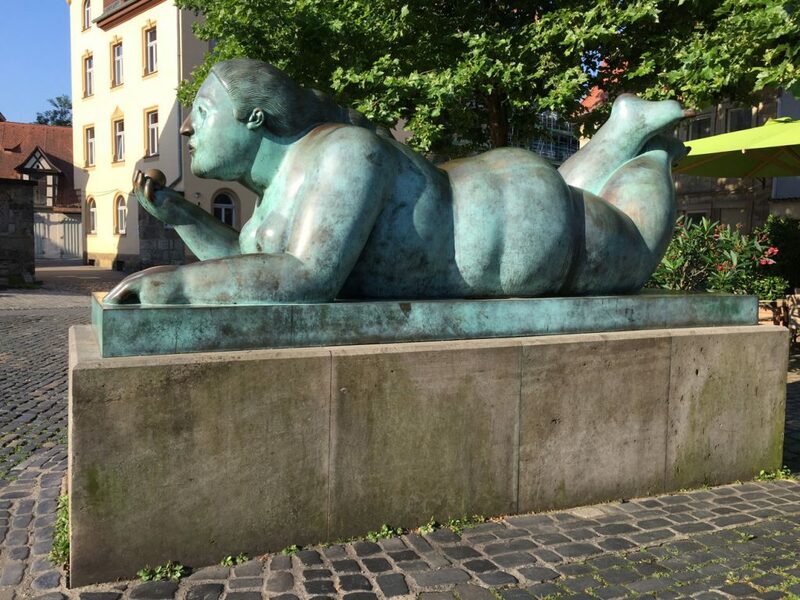 The pontoon capsized and Botero’s bronze sculpture was slightly damaged, after her involuntary bath in the river she returned to the Heumarkt. The untitled large sculpture from Cor-Ten steel by Bernd Wagenhaeuser on the Markusplatz measures three meters at its highest point, is 7.30 meters long and weights about three tons. Wagenhaeuser prefers to work with geometric basic forms such as circle, ellipse, cylinder and triangle which he combines with each other or knocks them out as negative shapes. “The sculptural basic shape is, in the broader sense, the circle. Contents are the polarity of forces, restrained dynamics and the duality of tensions“, Wagenhaeuser declared in 1997. Typical of his sculptures is their patina that covers the surface of the Cor-Ten steel. Bernd Wagenhaeuser (born in 1953) came to Bamberg in 1982, where he plays a major role in the cultural life of Bamberg, from 1992 to 2008 he was chairman of the Berufsverband Bildender Kuenstler Oberfranken. Swiss artist Bernhard Luginbuehl (1929-2011) is particularly known for his monumental large sculptures which he assembles from scrap. Discarded machines, tools, cogwheels or ship’s screws he merges to expansive sculptures that don’t conceal their former use and yet generate a poetic aura through the deliberate misappropriation. Luginbuehl was a close friend of Jean Tinguely’s for many years who is also well-known for his bizarre moving metal constructions. Mostly Luginbuehl’s works have simple titles that reveal his ironic handling of art and his own work, as well as his critical examination of the human civilization and its consequences for the environment. In 1964 and 1977 Bernhard Luginbuehl’s sculptures were presented at the documenta. The Anchor Figure 2002 was purchased by the Association of the Friends of the International Kuenstlerhaus Villa Concordia with support of the Oberfrankenstiftung. In 2001 the Internationales Kuenstlerhaus Villa Concordia organized an exhibition of large sculptures by Erwin Wortelkamp (born in 1938) in Bamberg. 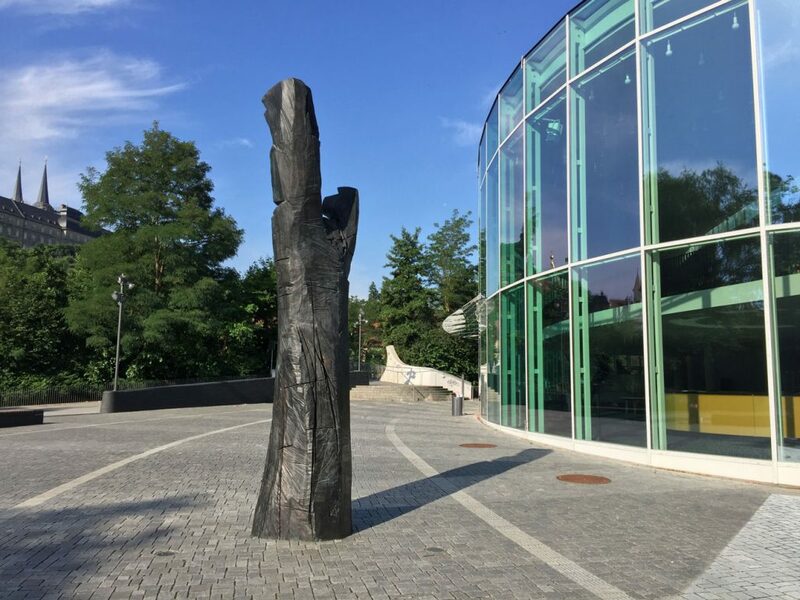 The almost five meters high wooden sculpture that was exhibited in the court of the university was cast in bronze after the exhibition and acquired by the Friends of the International Kuenstlerhaus Villa Concordia to be displayed permanently in Bamberg. The bronze cast looks like bog oak and comes so close to the wooden original that the viewer doesn’t recognize that it is from metal before he touches it. In his sculptural work Erwin Wortelkamp concerns himself with the topic of environment, both in the urban space and in the landscape which he sets in relation to his sculptures. Wortelkamp prefers to treat his wooden sculptures with a chainsaw, the outside often is untreated, weathered and black, whereas the inside is whitewashed which creates an exciting contrast.